Frontispiece woodcut portrait and portraits in the text. 230 x 180 mm (9 x 7 inches) - 145pp. G: in Good condition without dust jacket as issued. Cover rubbed and faded. Some cracking to upper joint. Contents bright. '...Till the entire reduction of that country, by the Victorious Arms of our most gracious Sovereign, King William. 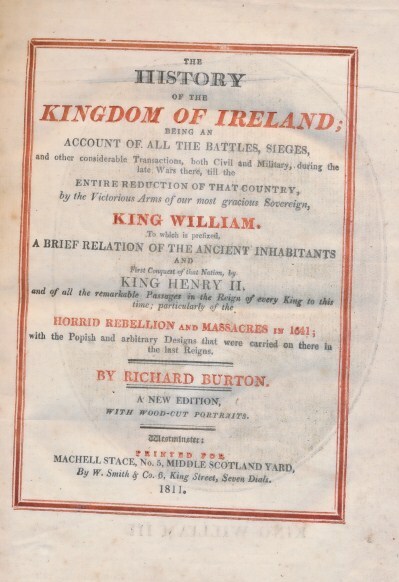 To which is prefixed a brief relation of the ancient inhabitants and first conquest of that nation by King Henry II, and of all the remarkable passages in the reign of every King to this time; particularly of the horrid rebellion and massacres in 1641; with the popish and arbitrary designs that were carried on there in the last reigns'.